Students and faculty listen in as recent graduates from RIT and MCC discuss what skills and characteristics manufacturing companies look for in young employees. Analysis shows that the number of graduates in the Rochester area with skills in applied integrated technologies/mechatronics, tooling and machining, and optical systems technology are on track to fall short of demand by over 400 jobs every year. In an effort to generate awareness about careers in advanced manufacturing, Eastman Business Park hosted its first annual Manufacturing Day program. 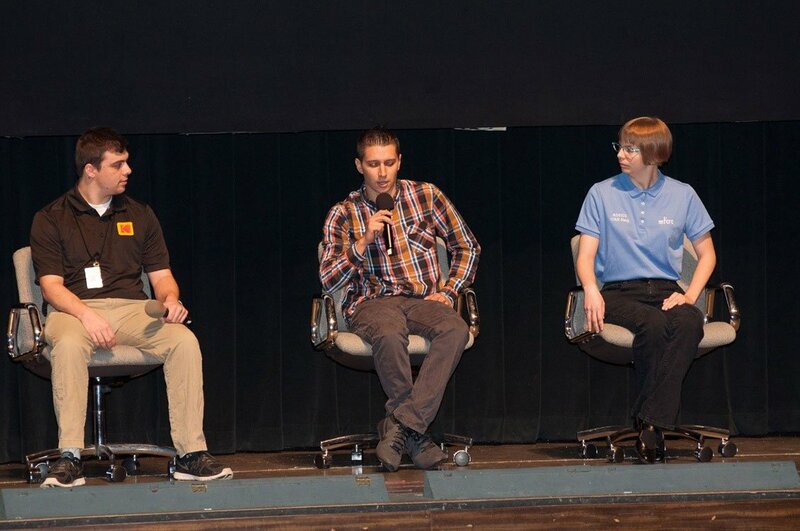 In a collaborative partnership with local manufacturers and educational institutions, the Park hosted 400 plus students from 11 high schools for an expo and presentation that included two panels. “Manufacturing continues to be a good way to earn a living,” said Dolores Kruchten, President of Eastman Business Park. “Our goal in hosting Manufacturing Day was to emphasize manufacturing as a career and to pique the interest of future manufacturing talent.” Eastman Business Park will continue to host manufacturing events in the near future to increase job awareness in the Rochester area.